Every internet facing web application, whether serving a large audience or a small set of users in a single region, is by default a global application. Whether you are running a large news website with millions of users across the globe, running a B2B application for managing your sales channels or a local pastry shop in a city – your users are distributed/roaming across multiple locations, or your application demands deployment into multiple locations for high availability or disaster recovery scenarios. As a global application, your distributed users and/or application deployments place demands on you to maximize performance for your end users and ensure the application is always-on across failures and attacks. Built atop Microsoft’s massive global network, Azure Front Door currently supports Microsoft’s biggest web workloads deliver high quality, highly performant services. Global brands such as Bing, Office 365, Xbox Live, MSN, LinkedIn and Azure DevOps leverage AFD’s competitive performance, enterprise grade reliability and massive scalability to deliver consistent, low latency, high throughput user and application experiences. Today AFD provides global coverage in over 35 countries across 65 metros and quickly growing. Below is a sample reference architecture outlining how an application can be designed for improved page load times, SSL offload and API routing. AFD runs at the Edge of Microsoft’s global network, performing TCP and SSL terminations close to end user, thereby improving performance of client access to applications. 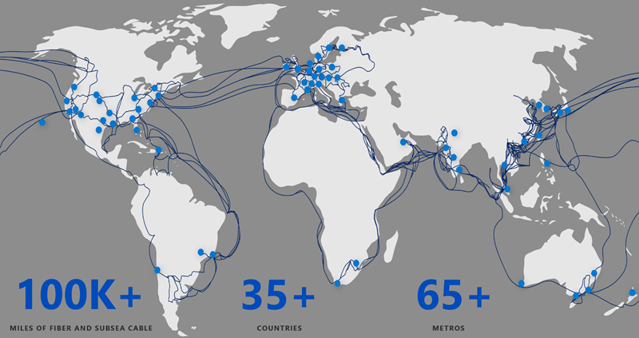 Traffic from AFD instances running at the Edge to application backends is routed on Microsoft’s private global network providing high reliability and optimized routing to the destination. 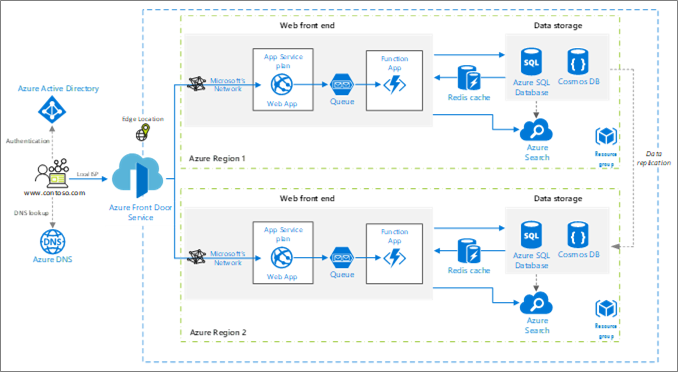 Another core Azure Front Door use case for building highly scalable apps is utilizing AFD’s smart load balancing algorithm to route traffic to the fastest available backend. Unlike the typical DNS-based load balancing systems, Azure Front Door delivers near instant failover across your application backends and with more granular control to even failover specific microservices. Our smart and efficient load balancing algorithms support both active-active as well as active-passive deployment configurations. Azure Front Door Service is now generally available, providing a 99.99 percent availability SLA and a myriad of features including SSL offload, URL redirect and rewrite, HTTP/2, IPv6 support, session affinity, simple domain onboarding with free or custom SSL certs, caching, and much more. You can also read about the AFD WAF Preview which is also available now as well! Azure Front Door’s GA pricing goes into effect on May 1, 2019. Until then, you will continue to be billed based on the preview pricing. Get started with the Azure Front Door Service today! To learn more about the service and the various features, refer to AFD documentation. If you are interested in exploring capabilities beyond the standard offering, simply file a feature request on our UserVoice page or feel free to contact us at afdfeedback@microsoft.com.